This Microsoft Access tutorial explains how to produce Cartesian product with Cross Join in Access Query. In SQL, there are several types of Table Join: Left Join, Right Join, Inner Join and Cross Join. Cross Join is to produce all possible combination of records in joined Tables which are unrelated (without common key), the result is known as Cartesian product. Most of the time we hate Cartesian product because it is usually a result of duplicated keys. Sometimes we need it because it helps us join unrelated tables together to form thousands of possible combination very quickly. Our goal is to join the two Tables so that each Product has all 6 different colors. Create a new Query. 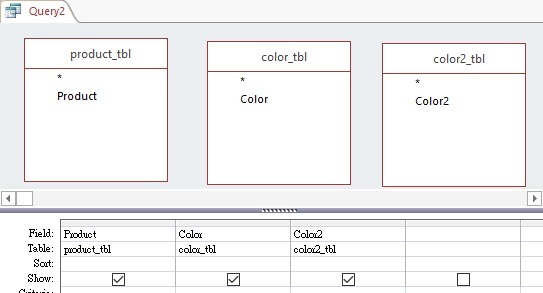 In Query Design View, add the two tables, select all the fields from the two Tables. 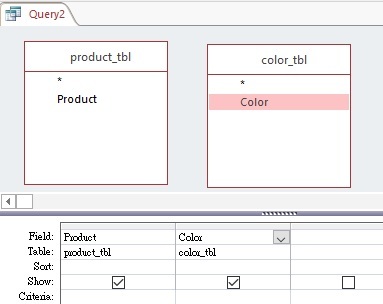 Run the Query, now each product has 5 colors. We can Cross Join more than 2 Tables. Suppose each color is further divided into Light color and Dark color, as defined in color2_tbl. Similar to normal Query, you can also type criteria in Cross Join. Unlike other SQL applications, Microsoft Access does not allow you to type the keyword Cross Join in the SQL, you only need to type all the table names you want to Cross Join in the FROM statement.